The nave is probably C12, the chancel C13 and the tower C13 or C14. A C13 south chapel became part of an aisle in the late C14, but was rebuilt together with the chancel in the C19. 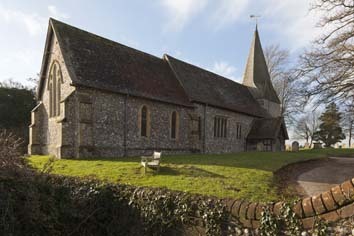 The church is picturesquely set with only a few old houses around it, with views of the Downs from the churchyard. The core of the nave is probably C12, though no detail remains. C13 changes can be identified from surviving evidence. A single double-chamfered arch, now the eastern one of the south arcade, shows there was a chapel here at right-angles to the nave, as at Hamsey. Its lack of abaci points to a date late in the century. 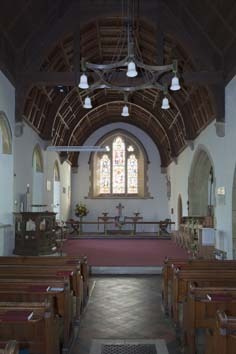 The big north east lancet of the nave, the only one of several known to have existed here to remain, is of the same date. The Burrell Collection drawing (1780) shows that as today the chancel had two north lancets (though these may have been altered as they are wider than usual). A related drawing of the same year (ESRO Par 235/4/12) shows also two large east buttresses. The undated Sharpe Collection drawing (probably 1805) shows more lancets to the south, so the chancel also dated from the later C13. There seems never to have been a chancel arch. The plain tower, lower than the nave, is dwarfed by the shingled broach spire, containing bell-louvres. Both drawings show them as they are today and the feature is likely to be original. Although generally given to the C13, the detail of the tower in fact looks C14, e g the angle-buttresses, a moulded west doorway and a tower arch with semi-octagonal responds and a double-chamfered head. The tower arch is identical to the definitely late C14 two western bays of the south arcade. When these bays were built, the C13 south chapel was incorporated in a narrow lean-to south aisle. With later alterations, this aisle is shown on the Sharpe drawing; the only visible feature is an east lancet, perhaps from the chapel. A doorway in the aisle was probably like the north one, replaced at this time. The Burrell drawing shows a large north porch, which may be partly old and possibly of the same date. The square-headed windows in the north nave and south chancel are certainly C15. 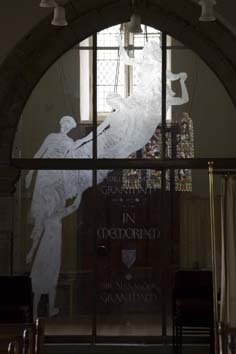 The north ones east of the porch are substantially original, including a four-light one, which may have been intended to provide more light, though the church is still dark. A further such window was inserted in the tower and the Burrell drawing shows a three-light east one of similar type. Later changes included windows and much rebuilding of the south aisle. The dormers visible on the Sharpe drawing show there was a gallery and there was also a dormer and an external stair on the north side for a west gallery (information from Edwin Macadam). The nave roof is said to been dated 1682 (2 p83) which could provide a clue to the date of the galleries etc. An engraving of shortly before 1880 (ibid opp p54) shows the interior with box pews and a tall two-decker pulpit, of which the upper part is said to be in the south aisle (information from Edwin Macadam). The restoration of 1878-79 (WSRO Ep/11/27/78) may have been preceded by an earlier one affecting mainly the chancel, of which there is no record. The evidence is the drawing by Adelaide Tracy (III p98) (1854), which shows an east triplet resembling neither the present east window nor the C15 one already noted. 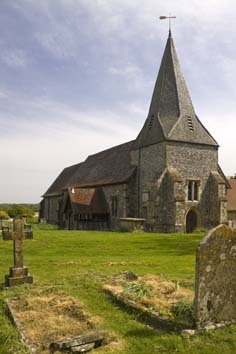 The main restoration followed a lengthy and complex dispute about the provision of churches in the parish, which is over six miles long from north to south with several scattered hamlets and the historic church stands near the southern end. Money for a chapelry for the northern part of the parish was collected in 1836 (ESRO Par 235/4/1/1) and around 1841 W Moseley designed a church for North Barcombe (ICBS), which could not be built because of legal and personal problems involving the rector (see 1 for details). In 1858 proposals were put to the Ecclesiastical Commissioners for a district church and three sites were proposed (ESRO AMS 5644/1). A design by B Ferrey known to have been made in 1859 for a small cruciform church in Barcombe (Eccl 20 p206) was probably related. There was some preliminary work on a new church in 1868 (4), but further disputes stopped construction and in 1872 there was a court case over the disposal of the money collected in 1836 (ESRO ibid). At this time there was also intense disagreement among the leading landowners in the parish over the rector’s proposal to replace the old parish church with a new one at Barcombe Cross (this led ultimately to the acquisition of a nonconformist chapel there that became St Francis). An alternative that was also considered was the enlarging of the existing parish church and in 1872 a faculty was sought for a north aisle by E Christian (WSRO Ep/II/27/77), but no further action followed. Fuller details of the controversy are to be found in the papers of Lord Monk Bretton in ESRO (especially MOB 747-783a). They reveal familiar problems over funding, tithes and other dues and the ownership of the graves that would be displaced by a new aisle. Monk Bretton (1825-97), a minister under Gladstone who was buried in the churchyard, is characterised by the DNB as unduly fussy and his machinations over Barcombe church bear this out. 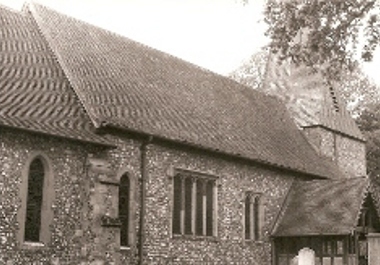 After the death of Robert Allen, the recalcitrant rector, in 1877 (1 p184) there was further discussion of the proposal for a new central church at Barcombe Cross, before it was decided to restore and extend the old parish church, largely because it was less expensive and because some of the landowners involved offered to provide most of the money. A new scheme was prepared to the designs of C L Luck (WSRO Ep II/27/78) (though H Card is said also to have been consulted). Luck replaced the roofs, most stonework and the north porch and repaired some bulging walls. He realised the plan for a large gabled aisle (though replacing that to the south), which overlaps the chancel with a vestry to the east. Unusually for the date, the detail derives from the C15 windows in the church. Incorporated in its walls are displaced tombstones. Luck also rebuilt the chancel to the original dimensions and replacing the north lancets, but not a doorway between, as shown on the Burrell drawing. 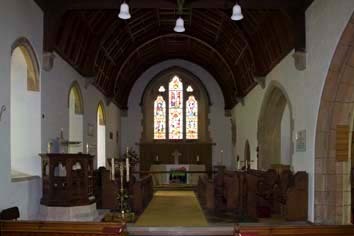 As a result, the church is largely C19, especially inside. A R G Fenning claimed to have undertaken a further restoration (WWA 1914), but nothing is known of this. Most recently, the chancel was re-ordered in c2010 when most of the C19 fittings with the exception of the pulpit were removed. The changes made will be apparent from two of the photographs above. As part of the agreement to retain and restore the old church, it was agreed to proceed with a new one for the northern part of the parish at Spithurst, on the site proposed in 1836, and this was completed in 1880. An extension, mainly of timber, was added off the south aisle in 2007 to the design of P Pritchett of J D Clarke and Partners (BE(E) p99). Chest: (South aisle) Small and plain, standing on legs and dated 1754. Font: Square C14 bowl with shallow carving that differs on each side – two quatrefoils, two cinquefoiled arches, two saltires with horizontal lines through them and four trefoiled arches. 1. 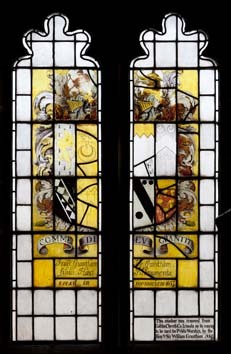 (North nave) Armorial glass dated 1657, which an inscription records was placed here in 1889, having been brought from Goltho Church, Lincolnshire. That village was the ancestral home of the Grantham family, more recently of Barcombe Place (church guide). 2. (South aisle, second and third windows) Given to C E Kempe, (1882 and 1900) on seemingly good authority both by Collins and by Robert Eberhard (www.stainedglassrecords.org retrieved on 16/3/2015), but the second does not resemble Kempe’s work at all. The third one has been removed (March 2015), presumably for renovation so it cannot at present be assessed. 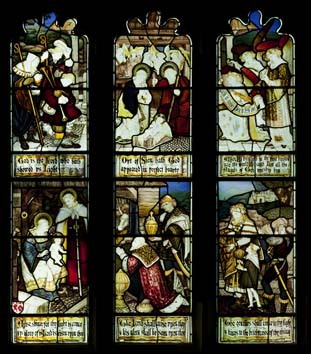 The first window, similarly said to be by Kempe and Co (ibid) and dated 1919 is in fact probably by the same unknown hand as the second; according to the inscription the first one is a memorial to Lord Monk Bretton. 3. (South aisle, east window) Kempe and Co, dated 1912 (actually 1919), depicting the Crucifixion. 4. (North chancel second window and north nave first window) These are said on the same authority as those in the south aisle to be by Kempe and Co, 1916. (two single saints). However, neither resembles their work and more research is needed on almost all the.glass attributed to Kempe and his successors. One is dated 1908. 5. (North nave, second window) Resurrection etc, Heaton Butler and Bayne (Bayne p126), c1887. 6. (Screen in tower arch) J Conway (Church Guide) engraved glass, c1981. Image-bracket: (North nave) C14 or C15. 1. (South aisle) Susannah Medley (d1730), attributed to W Palmer. Inscription flanked by two well-endowed caryatids. 2. (Chancel south) John Raynes (d1687) attributed to W Woodman senior (ibid). A cartouche, from which two putti hold back drapery. Above this is a curving broken pediment. Piscina: (Chancel) Reset late C13, quite large and with a trefoiled head. My thanks to Nick Wiseman for the colour photographs and for raising queries about the glass.